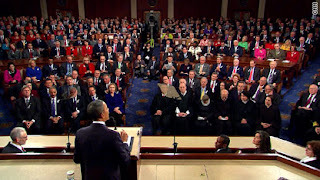 The State of the Union address will be January 24, 2012 at 9:00 PM. It will be televised on major networks and news channels. The text is usually printed the next morning in the newspaper, and the video available online. 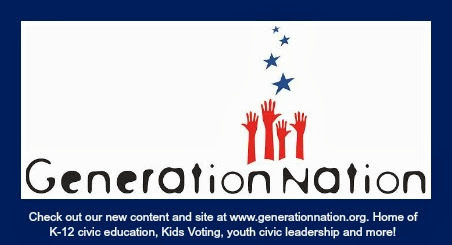 GenerationNation will post the text and video on its Civic Learning Center, http://www.kidsvotingcharlotte.org/ (also accessible from the main website http://www.generationnation.org/). The address is held at the US Capitol, in Washington, DC. It happens each January, after each year of the President’s 4-year term begins on January 20. It is an annual address presented before a joint session of Congress and held in the House of Representatives Chamber at the U.S. Capitol. The address reports on the nation, and allows the President to outline his legislative agenda and national priorities to Congress and the American public. Three branches of the federal government: Executive (President and Cabinet), Legislative (Congress) and Judicial (Supreme Court). At least one important official is selected to not attend. This is so that someone is available in the event something bad happens to the many important leaders who will be meeting in one location. First Lady and Special Guests: often, the President will invite guests who have been newsworthy or who represent a topic he will address. For example, if he plans to talk about education he may invite a teacher. The guests sit in the balcony with the First Lady. The State of the Union is a great civic learning opportunity. Students watch or read the State of the Union address and think critically about the speech, its content, how it is communicated and how it is reported. Fun, educational activities are available from GenerationNation. Teachers and parents can modify based on grade level or subject area. For example, focus students on the community, North Carolina, the United States or another country. Connect this to history, literature or in a global community. Write a headline and compare the headlines from different news sources. Evaluate the President's communication skills. Students may watch the State of the Union live, watch it in class or read the text. There are many opportunities for writing, reading, small group discussion and oral presentation. The activity aligns with several core standards. Do you have a dream, too?